This tall, long lived, perennial has pyramids of beautiful, rich blue, 2 inch, long lasting flowers held aloft on flower spikes. 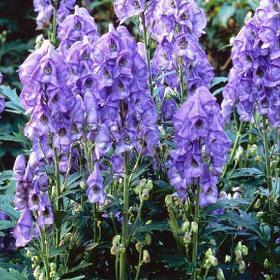 Aconitum is an excellent back of the border plant, easily grown from seed and will also last well as a cut flower. 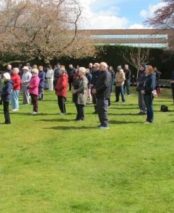 It requires humus rich moisture retentive soil in partial shade to full sun. This plants common name (wolf’s bane) give us a clue to one of the old uses of this plant as a poison for disposing of wolves and reminds us that it is highly toxic. The white bitter tasting roots were sometimes mistaken for horseradish in cottage gardens “often with fatal consequences”. This is a beautiful plant, but not one for a garden where young children might play without supervision!